The route through upper Queets Basin over Dodwell-Rixon Pass and down the Elwha Snow Finger to Elwha Basin is about 4 miles, with a 2000-ft. loss in elevation. The descent takes several hours. This cross-country route ends at the terminus of the Elwha River trail in a meadow at the confluence of the Elwha River and the creek draining Mt. Noyes. This location is marked as Elwha Basin on the USGS map. 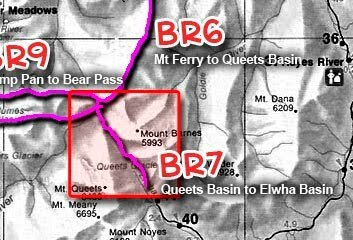 This is a good route for access to or retreat from the high country and a good way of ending a traverse of the entire Bailey Range. It is also a natural link with the trails or routes out of Low Divide. Dodwell-Rixon Pass is located in a somewhat hidden notch in the SE corner of upper Queets Basin. This natural approach to the high country was one of the first used by explorers, surveyors, and mountaineers. The early historic ascents of Mt. Olympus were done via this route. The position of the pass should be determined and a compass bearing noted before traveling in this area, in case of poor visibility en route. On the north end, this traverse can be linked with BR6 (Mt. Ferry to Queets Basin), BR8 (Queets Basin to Glacier Meadows), or BR9 (Camp Pan to Bear Pass). See the published Climbers Guide for detailed approach information. From Dodwell-Rixon Pass, the moderate "Elwha Snow Finger" descends SE to the upper Elwha River. This is not presently an active glacier, but is more accurately a transitional form, a permanent snowfield with some stagnant ice, the latter which occasionally appears in late season after seasonal snow has melted. Avalanches from Mt. Queets, Mt. Meany, Mt. Barnes, and Mt. Noyes pour large volumes of snow and debris onto the Elwha snow finger each year, mostly in winter and spring. The Elwha snow finger has receded dramatically in recent years. Hard glacier ice, crevasses, melt holes, snow bridges, and debris have been encountered, even in mid-season. Light crampons are recommended. Proceed with caution down the snow finger to the "Big Snow Hump," a bulge cause by avalanches off Mt. Queets and Mt. Barnes. Follow the river down 0.9 mile on snow or rocks, depending on conditions. At 3400 ft. look for cairns marking the start of a way trail leading to Elwha Basin. A faint trail leads up a brushy slope above where the river drops into a gorge. The route traverses a bench, crosses a ridge, then emerges into open meadows of Elwha Basin. This is near an unnamed stream and waterfalls from the E face of Mt. Queets. Descend open slopes to the river, which must be crossed to reach the end of the Elwha RIver trail. An alternate route, which is a steep and difficult bushwhack, starts near the Big Snow Hump. Traverse a meadow on the NE side of the river 100 yards below the hump, cross a thin tree band, and follow a game trail into the forest 30 ft. above a 15-ft. boulder. The trail rises 100 ft., then traverses, finally dropping to a stream. Cross and continue until the trail fades, then descend and traverse toward a meadow visible across the river. Follow game trails to the maintained trail.